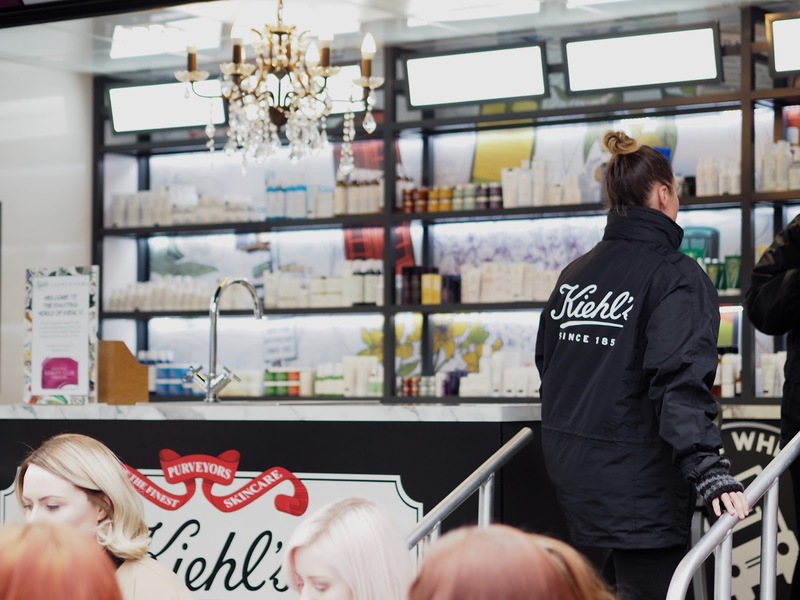 A few weeks back Kiehl's opened their new concession in Debenhams, Leicester and I was invited along on opening day! 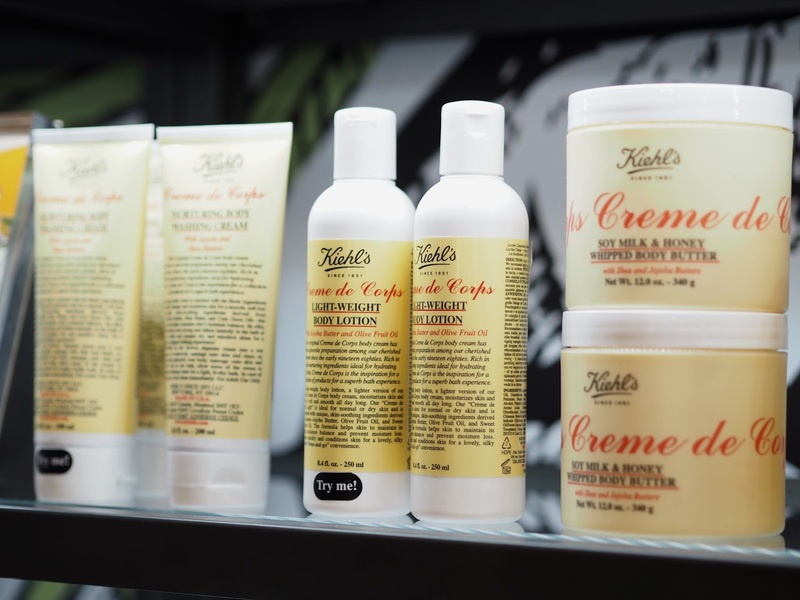 If you don't already know Kiehl's have been going since 1851, with what started out as an apothecary in New York and has grown and grown into the brand it is today providing top quality, premium products and skincare solutions. 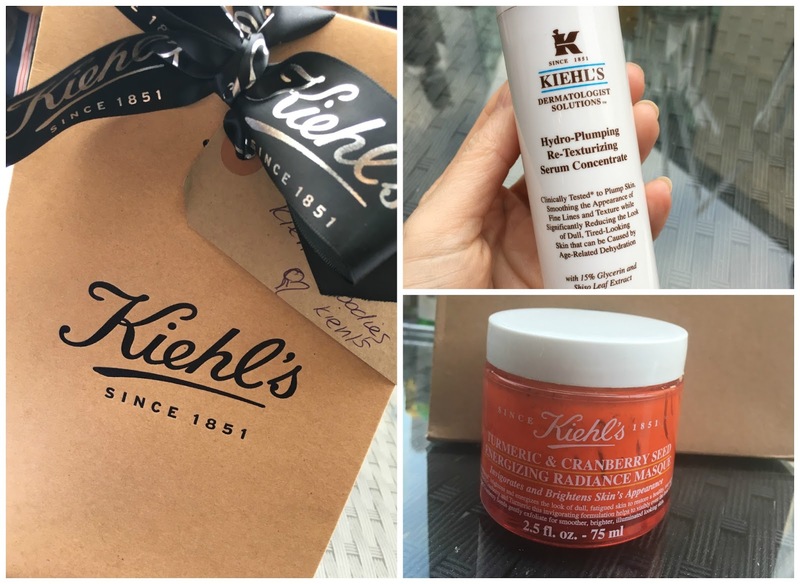 I've tried a few Kiehl's products in the past but was certainly eager to try more. 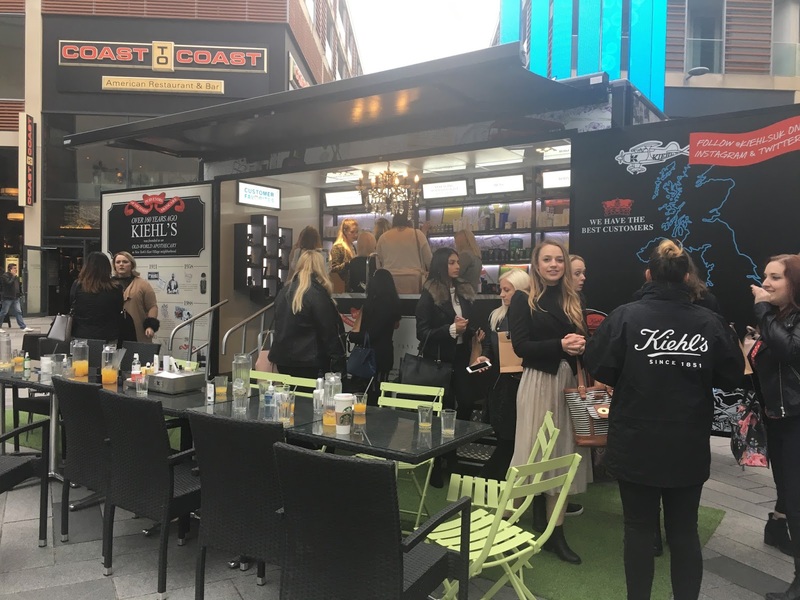 Our first stop was the 'Kiehl's on Wheels' pop up truck which was situated in St Peter's Square. Hannah and Saff greeted us and got us all seated around the table. I got rather excited at seeing all the treats laid out before us, fingers itching to get at the pots! 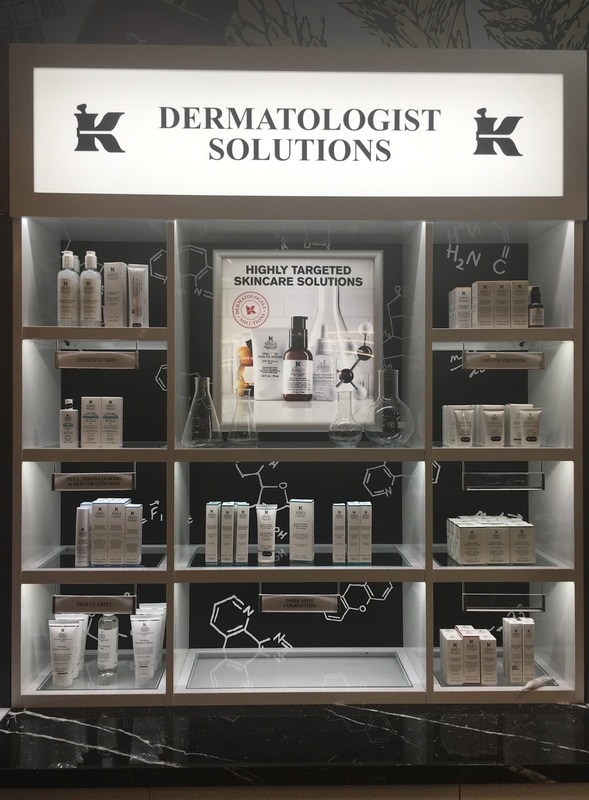 They worked their way through each product, some being best sellers, and some of them new launches, they explained the ingredients and benefits to the skin, and encouraged us to try as we went along. The only problem with trying everything is that I now have a Kiehl's shopping list as long as my arm, with the turmeric and cranberry seed energizing radiance masque at the very top, well, after the Midnight recovery concentrate of course, because actually that will forever be at the top of my Kiehl's shopping list! It was so evident that Hannah and Saff knew their stuff and were so passionate and eager to pass on their knowledge and everyone was just as eager to learn. We were then tested on that as we had a quiz with products as prizes!! I won myself the new cactus flower & tibetan ginseng hydrating mist. 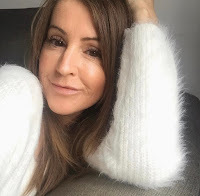 I was chuffed to bits as it was one of the new launches and as we passed it round I fell in love with it and mentally put it on my shopping list. It was great fun, if a little on the chilly side, and once we'd had a mooch around the truck we were all more than ready to head on inside to see the store. 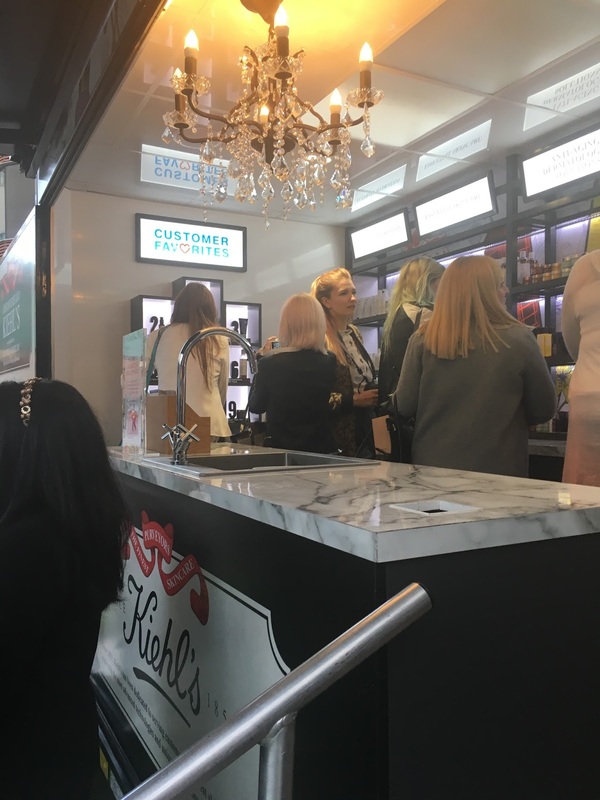 The concession is located next to the MAC counter and Urban Decay just inside Debenhams, and it's laid out in the traditional Kiehl's style. 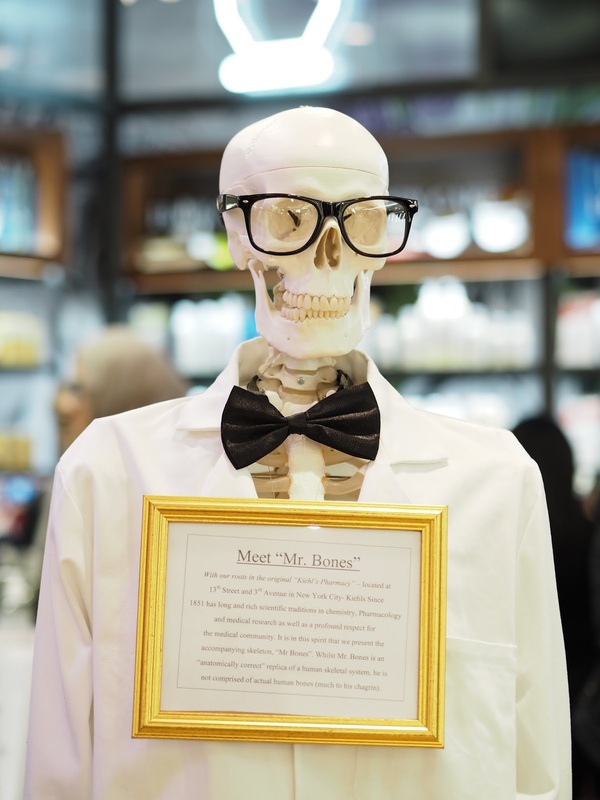 We were greeted by Mr Bones of course! We were left to browse at our leisure and I think I left with half the store all over my body because I'd covered every bit of on show flesh with something or other! 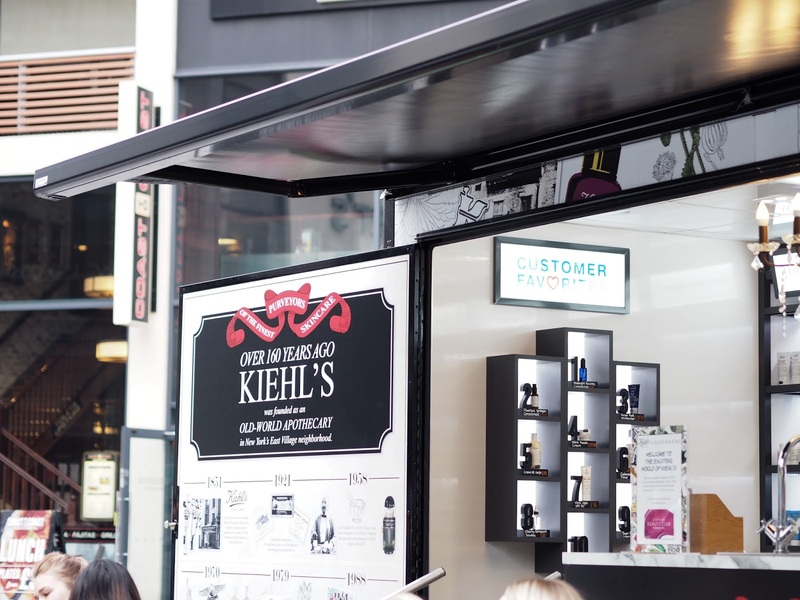 The lovely Kiehl's consultant was on hand for any questions and to book us in for a personal skin consultation. As I said, shopping list as long as your arm but I'll have to stick to a few items for now I think as the bank balance just won't stretch. 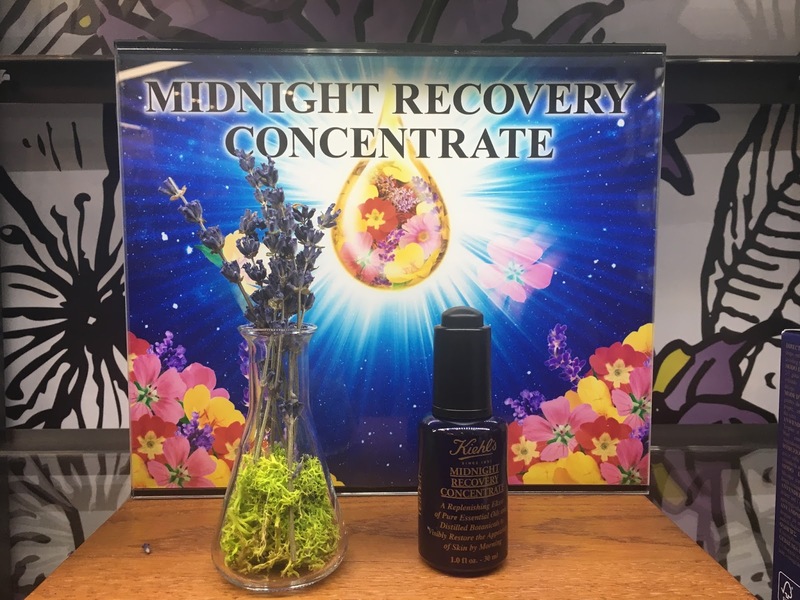 You know my absolute fave is the Midnight recovery concentrate, of which I need more of. I absolutely adore it and it's become somewhat of a cult product for Kiehl's. If you've never tried it, you MUST and you WILL fall in love. I also want to try, no, scrap that, I NEED to try the turmeric and cranberry seed energizing radiance masque because I loved it when it was passed around the table and I tried a small bit of it on the back of my hand, the result and difference in the skin on my hands was quite astonishing and it wasn't even on for the suggested amount of time, so imagine the results on your face! I won myself the cactus flower mist, so the only thing I want is their ultra light daily UV defense, a high protection spf50. We were given a generous goody bag with lots of samples, and I've worked my way through them already, yes I added more to my shopping list. 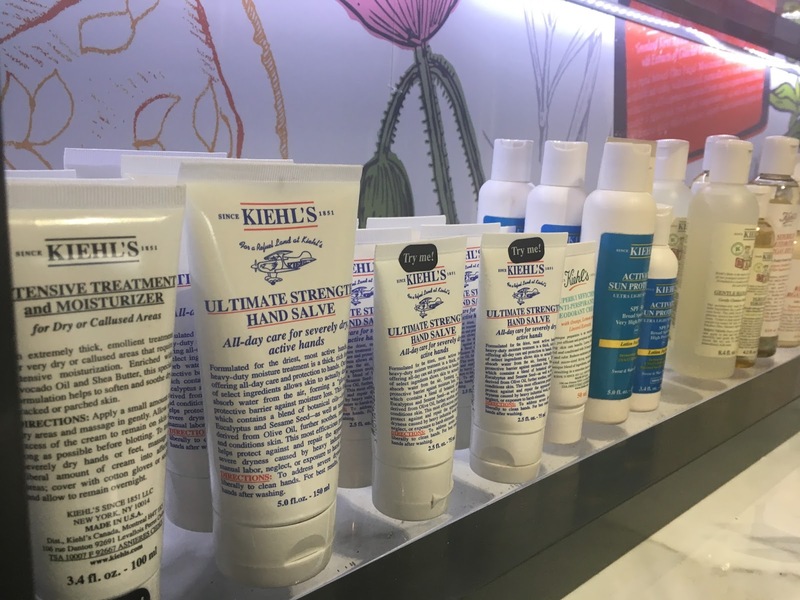 If there any products you like the look of and would like to try, pop into Kiehl's because the staff there really do know what they're talking about and will be more than happy to help you find what your skin needs, and they're a brand that are always happy to give out a sample or two and I like that. 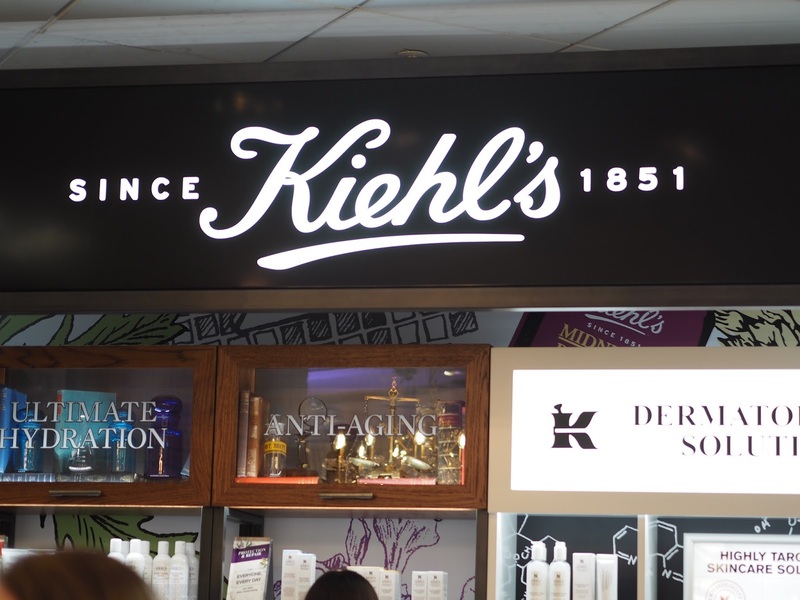 Thank you to Kiehl's and Hannah and Saff for inviting me along. Have you tried Keihl's? What's your favourite product?